This young plant was delightfully fresh. We've seen examples of more mature, larger plants as well as smaller specimens. This species is known by multiple names. We show another more mature example from this genus, Tithymalus montanus. See detailed information here. Do be sure to check it out. The sap of this plant is a toxic irritant. See the beautiful Snow On the Mountain (same plant family) here. Plant location: Hwy 36 East, about 5 miles from Estes Park. The date was May 7, 2009. Bloom season: May through July, can be found in bloom as early as March. This plant is easily confused with Lesquerella ludoviciana. Our example is on the previous page of Yellows. 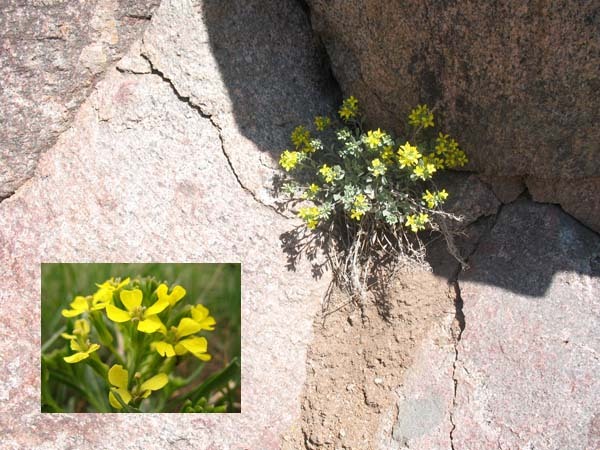 Look at the base of this plant; the growth conformation of the mountain bladderpod is more circular and distinctive with foliage than that of the former, the stems of which tend to come up individually from the base. 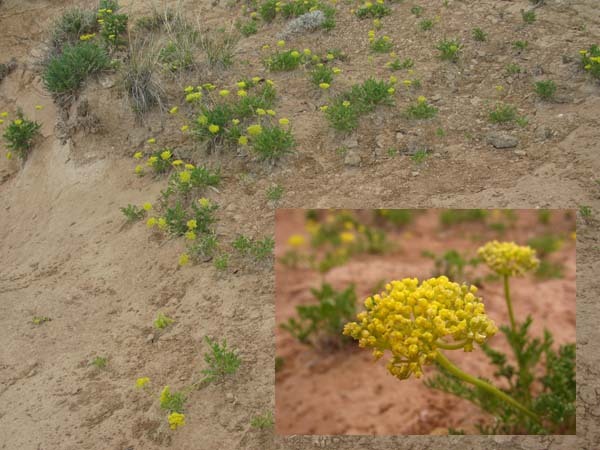 The family Brassicaceae is quite large with 330 genera hosting 3700 species roughly. This information is from the Royal Botanic Gardens at Kew in Great Britian. There are close to 80 species in the Lesquerella genera. 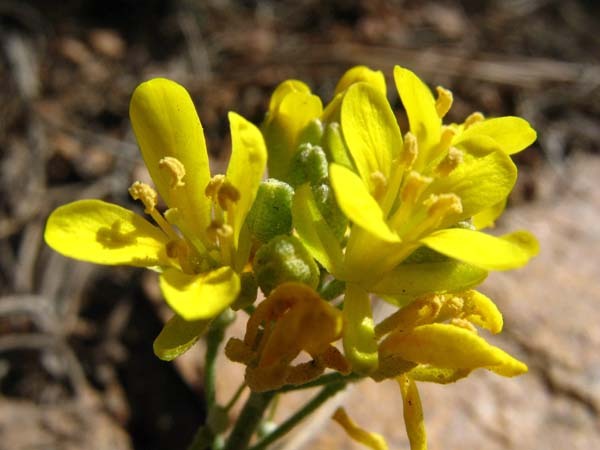 Maybe the most notable use from plants of this genus is the extraction of Bladderpod Oil from some of the species. WIKIPEDIA has this on the substance: 'Most Lesquerella species contain the hydroxy acid lesquerolic acid in their oil, and L. fendleri contains the most by far, with a seed oil content of around 24%. This oil is useful as a replacement for castor oil in some applications.' End quote Plant location: Sighted on April 30, 2008 somewhere in Colorado - we don't remember WHERE!! This plant is a perennial with a fairly small distribution. 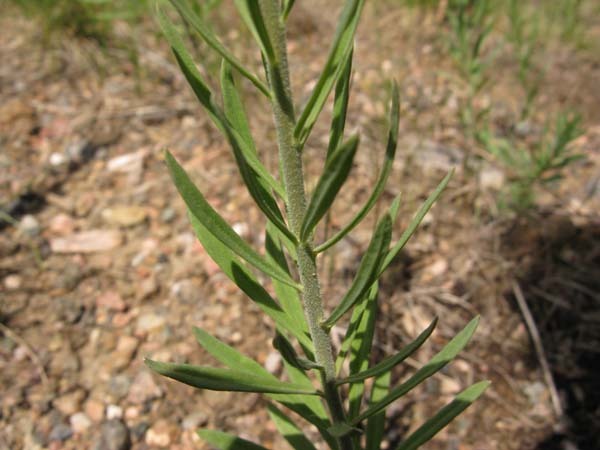 Colorado is one of only 5 other states in which this plant can be found. This is according to the USDA plants database website, an excellent source of plant information. A link to the site can be found on our homepage. Bloom period: May and June - but obviously ours was slightly earlier. 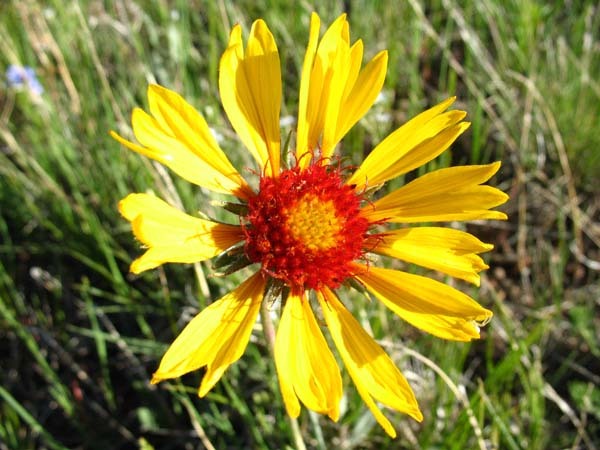 Here is another example from the genus Gaillardia, of one tough but stunning looking plant. Why tough? These plants are quite hardy. They resist heat and conditions with little water very well. Some species will even bloom in sand along beaches. The flowers are of brilliant colors with large enough blooms to stop drivers cruising along the road for a closer look. Well, this is true for US anyway. Our example here is called the red-eyed sunflower. We have seen many of the other Gaillardia, Indian Blanket, but only one of this specimen. The rumor is that the plant parts boiled in water to make a drink can not only aid with digestive problems but also reduce hair loss. Plant location: Found in the foothills of the Rocky Mountains Colorado, June 6, 2008. How embarrassing, our plant photograph here is soft and not at all up to our usual standard. However, it was the only picture we had to show. Will try for an improved version on the next sighting! Bloom period: Mid to late summer. 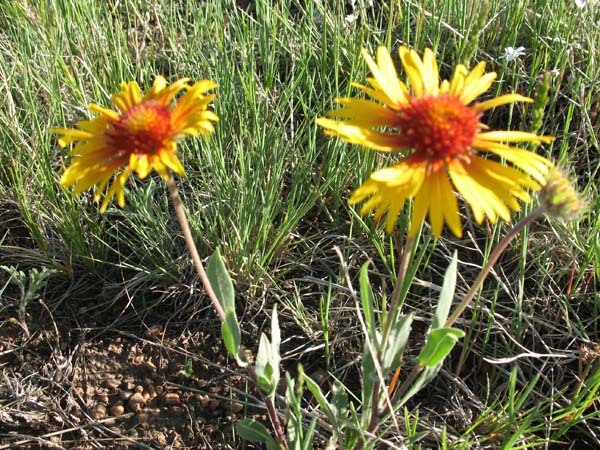 See the other member of this genus, Indian Blanket, in the Reds/Oranges, Page 2. This member of the phlox family certainly does not look like it belongs! 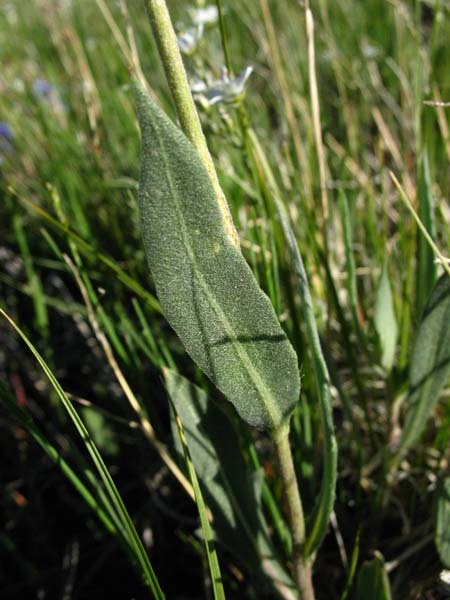 The low matted form of the plant could possibly protect it, as well as it's occurance in arid more remote areas of Colorado. Lack of proximity to human habitation is a good thing for this plant! 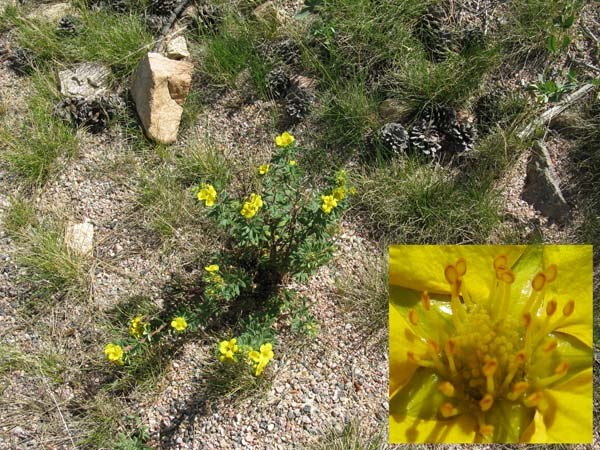 The plant has been sighted in the southern part of the state, Mesa de Maya, as well as Pawnee Butte. The book Colorado's Best Wildflower Hikes has a good descriptiion of the plant. Mention is made of the plant's tendancy in the evening to emit a rich aroma which is hard to define. I regret we were not in the area of the plant at this time of day to treat our noses to this scent. 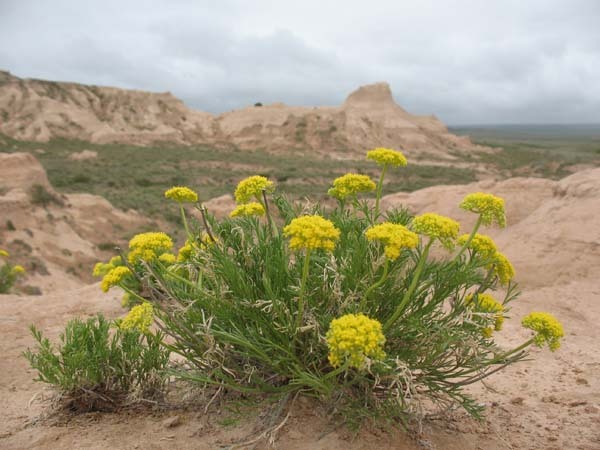 A trip back to Pawnee Butte to further explore this unusual plant is called for! 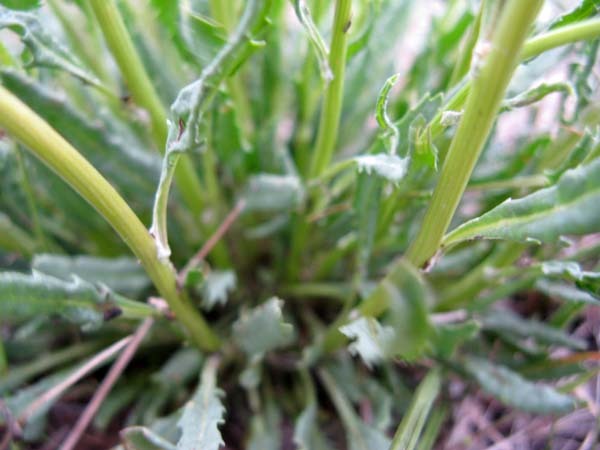 This technical description of the plant is from the website Montana Field Guide: 'Leptodactylon is a cushion-forming perennial with a highly branched rootcrown that gives rise to numerous herbaceous stems that are up to 2 cm high. 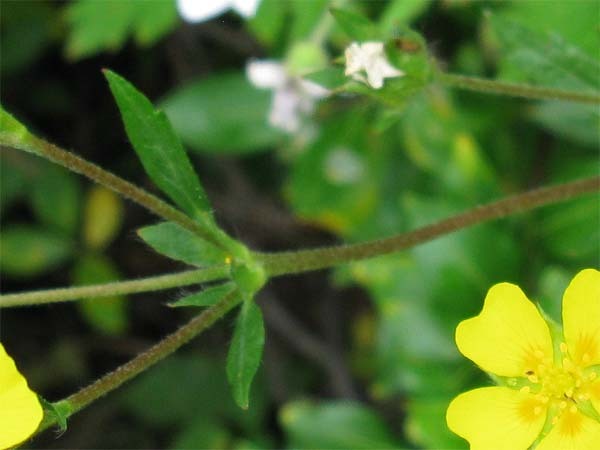 Each stem is closely covered by opposite, deeply 2-3 equally-lobed, spine-tipped leaves that are 3-6 mm long. The foliage is glabrous to glandular. Solitary flowers are borne on the stem tips. The pinkish-white, tubular corolla is 12-20 mm long and flares into 4 spreading lobes. 4 anthers are borne near the top of the tube, and the calyx is 5-8 mm long with 4 shallow, pointed lobes. The fruit is a round capsule.' End quote. Plant location: AGAIN......! Seen on a hike in the Pawnee National Grasslands - Pawnee Butte, Trail #840 on May 26, 2008. This was an excellent hike for sighting wildflowers!! We identified no less than TWENTY-FIVE new species of wildflowers on this hike. Having just moved to Colorado, this was a wonderful introduction to the Plains wildflowers of Colorado. We highly recommend this specific hike. Bloom period: May through June. Linaria is a genus of about 100 species of herbaceous annuals and perennials that was traditionally placed in the foxglove family Scrophulariaceae. 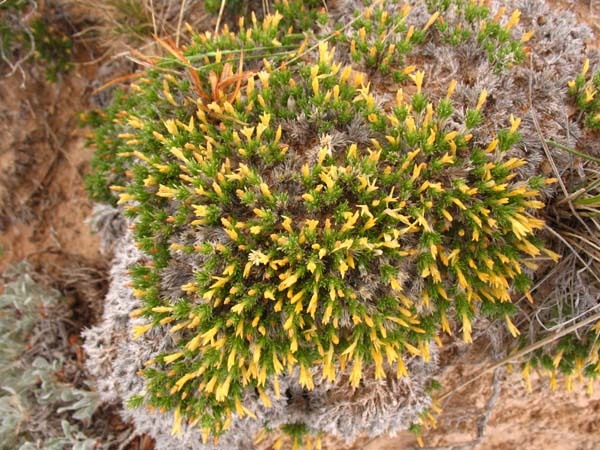 Due to new genetic research, it has now been placed in the vastly expanded family Plantaginaceae. The genus is native to temperate regions of Europe, northern Africa and Asia, with the highest species diversity in the Mediterranean region. 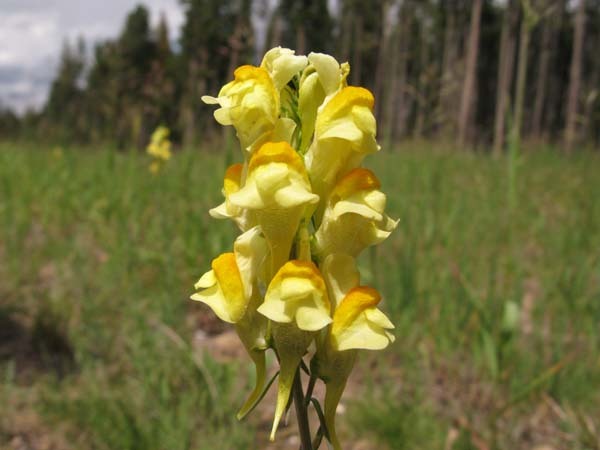 The members of this genus are known in English as toadflax, a name shared with several related genera. The scientific name means "resembling Linum" (flax), which the foliage of some species superficially resembles. 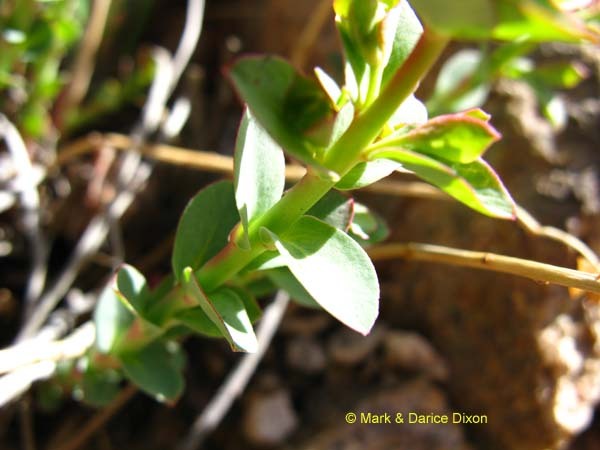 Closely related genera include the Nuttallanthus (American toadflaxes, recently split from Linaria), Antirrhinum (snapdragons) and Cymbalaria (Ivy-leaved toadflaxes). 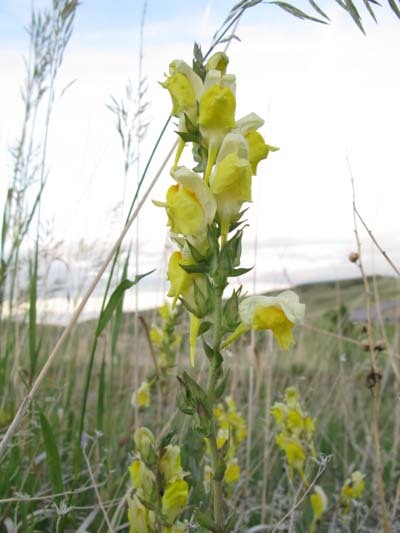 Common toadflax is especially valued for its strongly laxative and diuretic activities. Internally it us used in the treatment of edema, jaundice, liver diseases and skin problems. 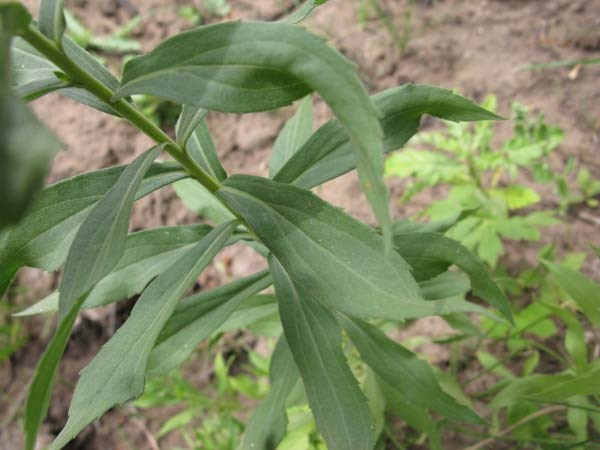 Externally it is used in an ointment to treat hemorrhoids, skin eruptions, sores and ulcers. The juice of the plant is a good remedy for inflamed eyes, though should be used with caution. Dosage is critical and it should not be given to pregnant women, since the plant might be slightly toxic.' End quote Plant location: On June 6, 2008 we sighted this specimen in the foothills of the Rocky Mountains of Colorado. Bloom period: July and August. Note the rounded leaves close together on the stem. 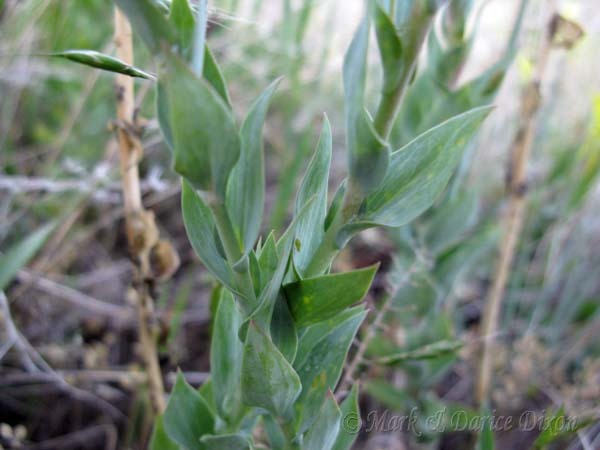 This is a distinguishing feature to help differentiate this plant from Linaria vulgaris, common Butter and Eggs. 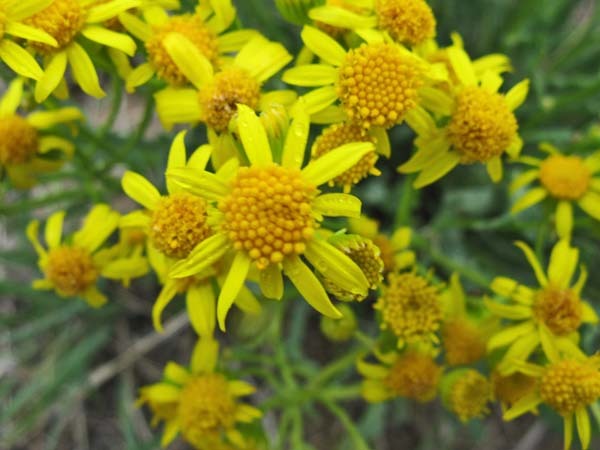 Asteraceae has the greatest number of flowering species of all families. There are 64 species in the genus Packera. For us, it is hard to accurately identify species from this family. So many are similiar! 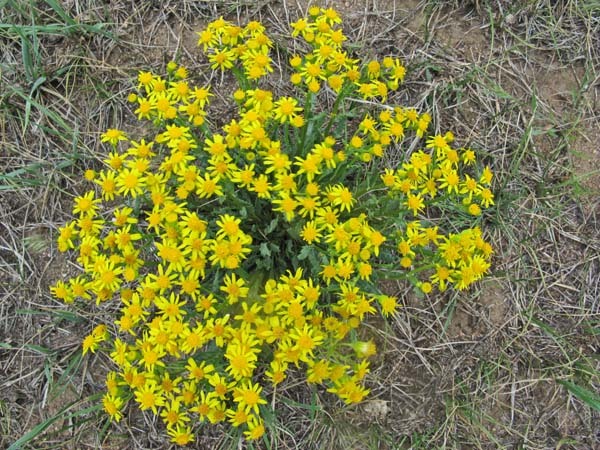 In addition the flowers have been reclassed as Packera from Senecio. WIKIPEDIA has this on the genus: 'Senecio is a genus of the daisy family (Asteraceae) that includes ragworts and groundsels. 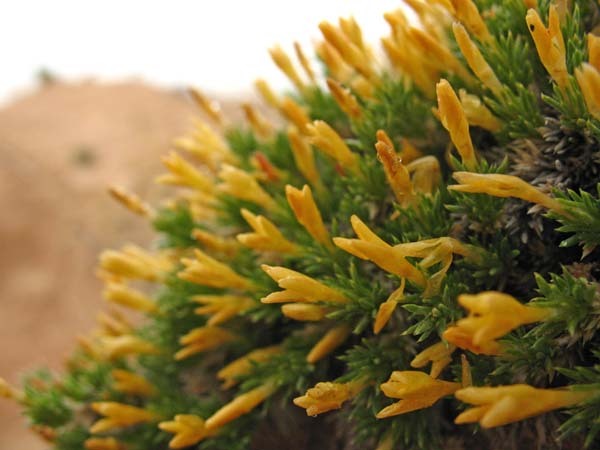 The flower heads are normally rayed, completely yellow, and the heads are borne in branched clusters. Though of late the genus has been reviewed and split up, it still contains a vast number of species (about 1,500) of extremely wide form including leaf succulents, stem and tuber succulents, annuals, perennials, aquatic forms, climbers, shrubs and small trees. Some species produce natural pesticides (especially alkaloids) to deter or even kill animals that would eat them.' End quote. 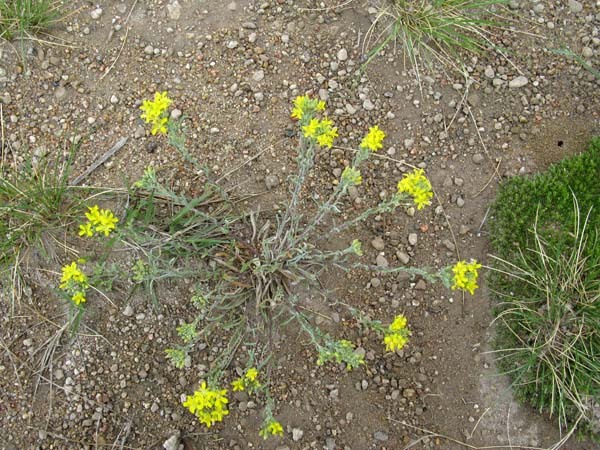 In some areas Fendler's groundsel is considered an invasive weed. Plant location: AND YET AGAIN......! Seen on a hike in the Pawnee National Grasslands - Pawnee Butte, Trail #840 on May 26, 2008. This was an excellent hike for sighting wildflowers!! We identified no less than TWENTY-FIVE new species of wildflowers on this hike. Having just moved to Colorado, this was a wonderful introduction to the Plains wildflowers of Colorado. We highly recommend this specific hike. Bloom period: Spring through Summer. Per WIKIPEDIA 'Linaria vulgaris (Common Toadflax) is a species of toadflax (Linaria), native to most of Europe and northern Asia, from the United Kingdom south to Spain in the west, and east to eastern Siberia and western China. 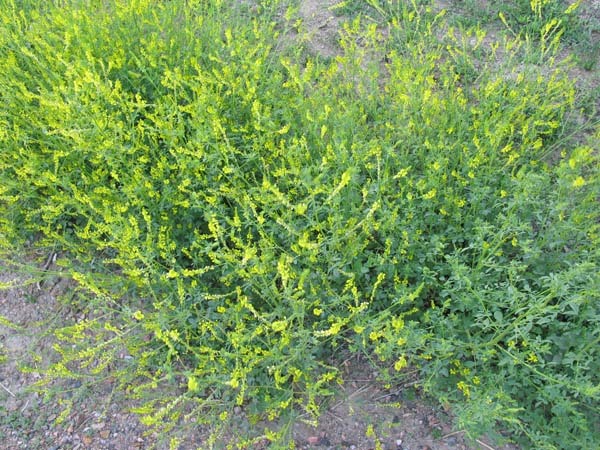 The plant is widespread on ruderal spots, along roads, in dunes, and on disturbed and cultivated land. Because the flower is largely closed by its underlip, pollination requires strong insects such as bees and bumblebees (Bombus species). 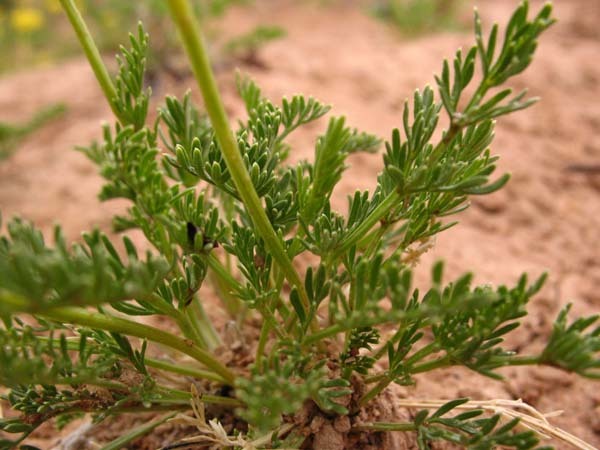 It has escaped from cultivation in North America where it is a common naturalised weed of roadsides and poor soils; it is listed as an invasive species in several U.S. states and Canadian provinces. 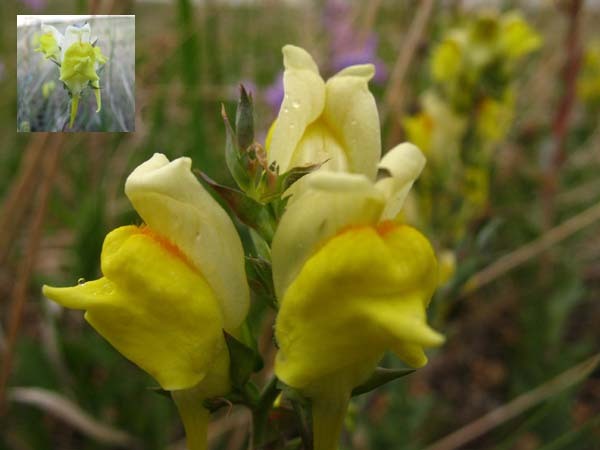 Common toadflax is especially valued for its strongly laxative and diuretic activities. Internally it us used in the treatment of edema, jaundice, liver diseases and skin problems. Externally it is used in an ointment to treat hemorrhoids, skin eruptions, sores and ulcers. The juice of the plant is a good remedy for inflamed eyes, though should be used with caution. Dosage is critical and it should not be given to pregnant women, since the plant might be slightly toxic.' End quote. Plant location: Outside of Laramie Wyoming on July 25, 2008. Bloom period: A long blooming flower - June to October. Another specimen of the Pea family. 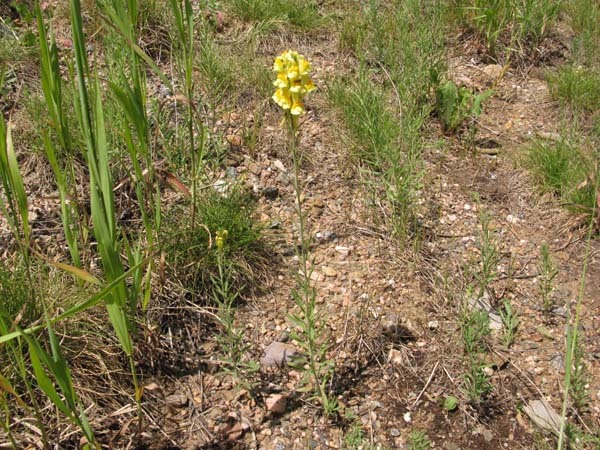 This was one of our first sightings of a NEW wildflower in the state of Colorado! An experiment is soon to be in the works, a collection of bundles of this plant to dry. Their aroma is said by WIKIPEDIA to increase with time when dried. More information is this: 'It has been used in herbal medicine. Naturopaths claim that it helps promote lymphatic drainage and reduces fluid retention, particularly in the tissues of the vein wall. 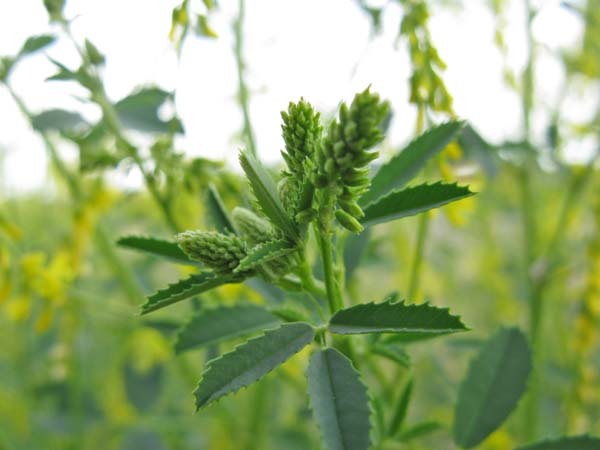 Yellow sweet clover is a major source of nectar for domestic honey bees.' End quote. 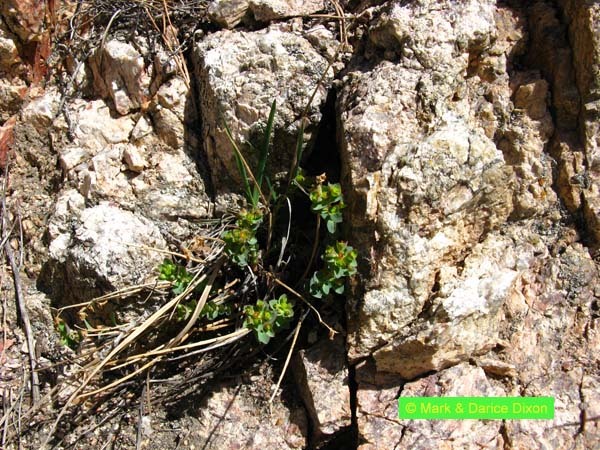 Another source has this: 'Melilotus officinalis, a non-native species being considered for noxious weed classification in Colorado, is one of our most common plants. It was frequently used to stabilize bare slopes, and it was also widely planted throughout the U.S. by bee keepers; it has since spread to all parts of the foothills and mountains of our area. It is common in meadows, driveways, lawns, and along trails in many areas of the United States. Philip Miller named this genus in 1754 and Pallas named this species Melilotus officinalis in 1776 altering Linnaeus' Trifolium melitlotus-officinalis of 1753.' End quote (from Southwest Colorado Wildflowers.com.) Plant location: On May 25, 2008 we saw these lovely flowers at Big Dry Creek, an Open Space in Westminster Colorado. Bloom period: An extensive flowering season includes spring, summer, and on through fall. This species is another instance of a solo memeber in a genus, with two subspecies: fructicosa and floribunda. 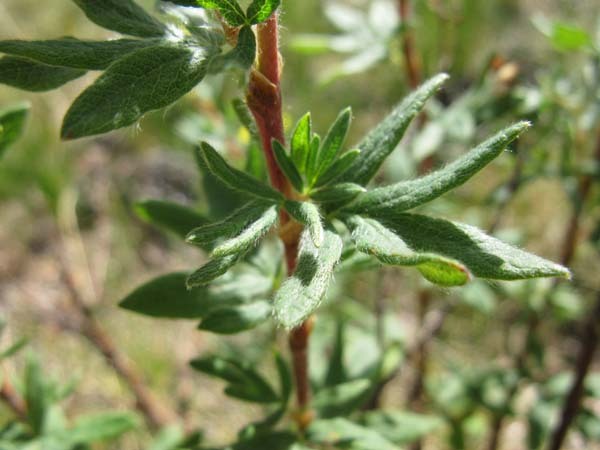 The perennial shrubs are native to subarctic areas of the Northern Hemisphere. Many cultivars for landscape and cultivated gardens have been created from this species. According to WIKIPEDIA, well over 100: It is very often used by cities and businesses for landscaping because of its hardiness and low maintenance. It was introduced into cultivation in the 1700s, but many of the modern cultivars, particularly those with orange or red flowers, derive from collections by Reginald Farrer in western China in the early 20th century. Plants are most often still grown and sold under the old name Potentilla fruticosa. 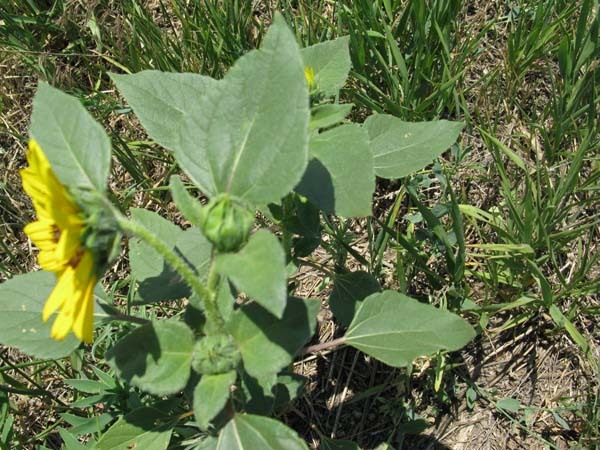 As well populated throughout the United States and Canada as the plants are it is unexpected to discover that in Iowa the plants are classfied as threatened, and in Pennsylvania, endangered. EDIBLE AND USEFUL: Per the website Plants For a Future is this: A tea is made from the dried leaves. 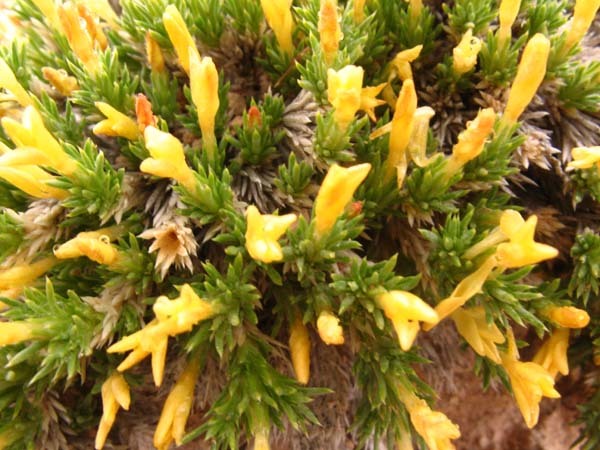 Used as a substitute for China tea, especially by people living at high elevations in the Himalayas. Can be grown as a medium size informal hedge. Some forms, notably 'Longacre', 'Elizabeth' and 'Gold Drop' have a dense spreading habit and make good ground cover plants. 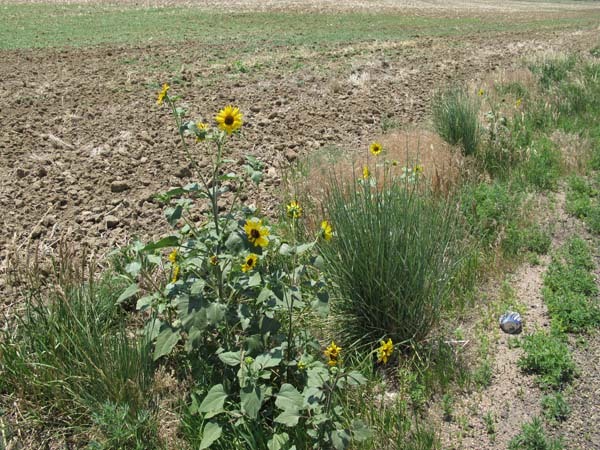 A useful plant for controlling soil erosion. The dry, flaky bark is used as a tinder for friction fires. (fires started by rubbing 2 pieces of wood together very fast). The powdered plant is used as an incense. The leaves are used as a packing material in pillows. A good bee plant. Members of this genus are rarely if ever troubled by browsing deer. Per WIKIPEDIA: 'Lesquerella is a genus of flowering plants in the family Brassicaceae. 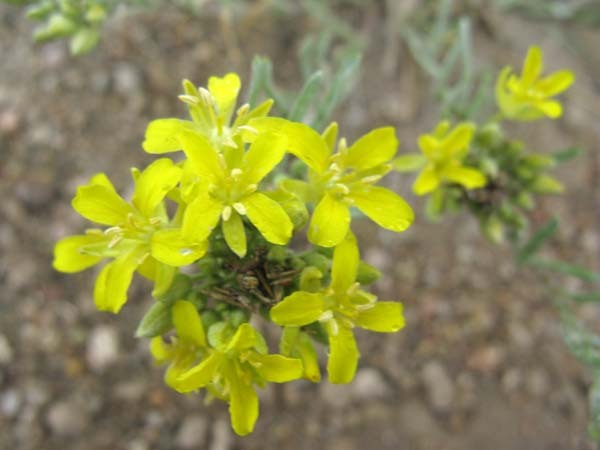 Bladderpod oil is extracted from the seeds of Lesquerella fendleri and certain other species in the genus.' End quote Plant location: AGAIN......! Seen on a hike in the Pawnee National Grasslands - Pawnee Butte, Trail #840 on May 26, 2008. This was an excellent hike for sighting wildflowers!! We identified no less than TWENTY-FIVE new species of wildflowers on this hike. Having just moved to Colorado, this was a wonderful introduction to the Plains wildflowers of Colorado. We highly recommend this specific hike. Bloom period: Spring and Summer. 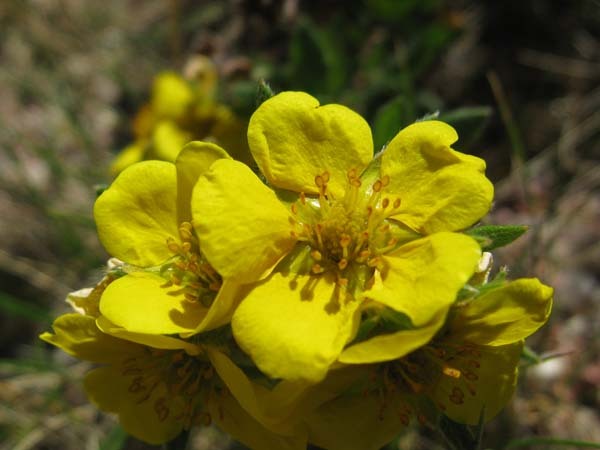 A reasonably widespread cinquefoil, this is one of our favorites. It's SO pretty. Cinque means five for the number of petals. Typically, the species counts belonging to this genus varies greatly between Wikipedia and the USDA Plant Database: Wiki, 500 species - USDA, 84 species. Pulcherrima is a perennial herb. The foliage and also flowers can often resemble strawberry plants, with fruit, though, that is not really edible and is quite dry. Some members of the genus are called barren, or mock, strawberries. 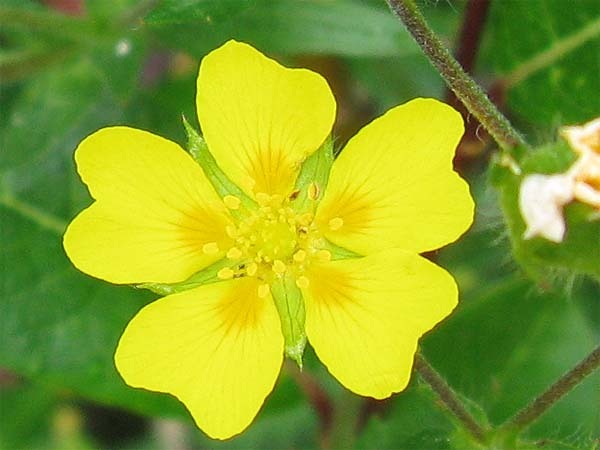 Genus FunFacts: From WIKIPEDIA - In heraldry, the cinquefoil emblem or "potentilla" signified strength, power, honor and loyalty. Depiction of the five-petaled flower appears as early as 1033, in the architecture of the church built in the village of Reulle-Vergy (Burgundy, France), two years before the reign of William the Conqueror. The cinquefoil emblem was used generously in the architecture of numerous churches built in Normandy and Brittany, through the 15th century. From the 11th to 14th century, the word potence - related to Potentilla - was used mainly in a military context and to describe the condition of the soul. 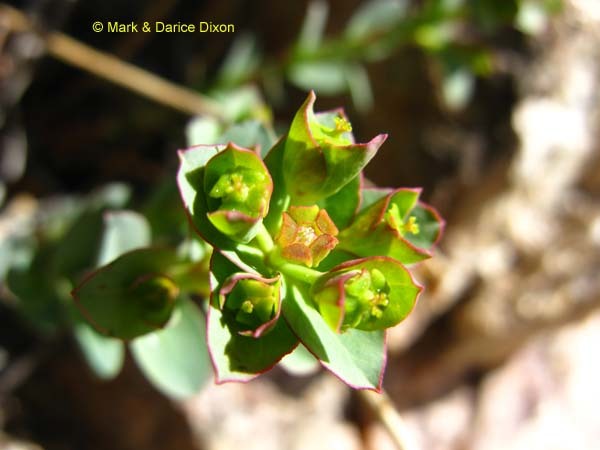 The Colorado Plant Database (through Colorado State Unitversity Extension) offers a great technical description of this group. We appreciate the explanations of the meanings of the botanical terms: Family Characteristics - trees, shrubs, or non-woody plants; radially symmetrical flowers (can be divided in half any way to produce mirror images), 5 petals, hypanthium (fused bases of floral structures forming cup or tube); alternate leaves (one leaf per node - joint of the stem where the leaves join stem), simple (not divided into many similar parts) or compound (divided into 2 or more similar parts) with paired stipules (leaf-like appendages where leaf stalk joins stem); many commercial fruits in this family (strawberry, peach, apple, raspberry, cherry, plum). Plant location: Near Ouray Colorado on August 24, 2008. Found in the following United States and Canada: USA (AZ, CO, CT, ID, MN, MT, NH, NM, NV, OR, SD, UT, WA, WY), CAN (BC, MB, SK). Bloom season: June through August and sometmes Seeptember. 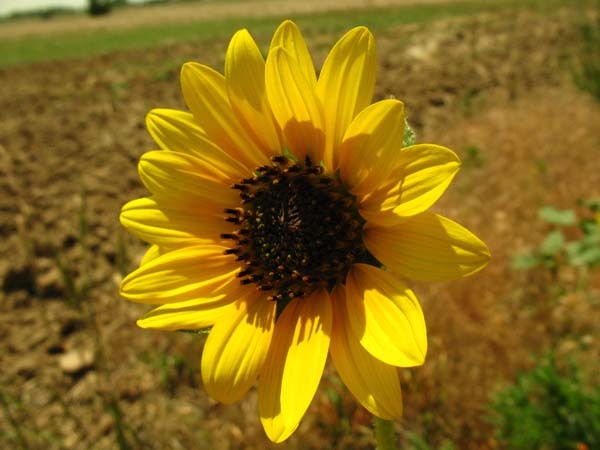 Like it's cousin the Giant Sunflower, this plant's blooms produce delicious sunflower seeds. The plant has provided food for animals and humans for a very long time. The seeds can be ground to make flour, pressed to yield oil, as well as produce medicines. Per WIKIPEDIA...'The Helianthus L. genus comprises 67 species and several subspecies in the Asteraceae family, all of which are native to North America, with some species (particularly Helianthus annuus (sunflower) and Helianthus tuberosus (Jerusalem artichoke)) cultivated in Europe and other parts of the world as food crops and ornamental plants. These are usually tall, annual or perennial plants, growing to a height of 50-390 cm. The rough and hairy stem is branched in the upper part. 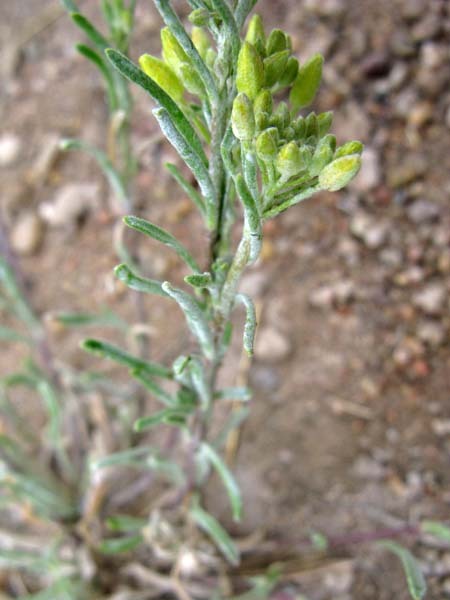 The petiolate leaves are dentate and often sticky. The lower leaves are opposite, ovate or often heart-shaped. The upper leaves are alternate and narrower. 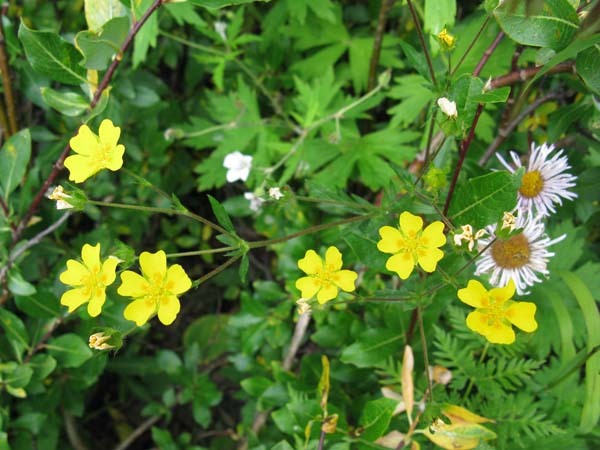 They bear several to many wide, terminal capitula (flower heads), with bright yellow ray florets at the outside and maroon disc florets inside. These flower heads follow the direction of the sun, going from east to west during the day.' End quote. Want a seed anyone? Plant location: Seen along the roadside at Sable and 120th Ave in Brighton Colorado on July 3, 2008. Bloom period: Summer through Fall. 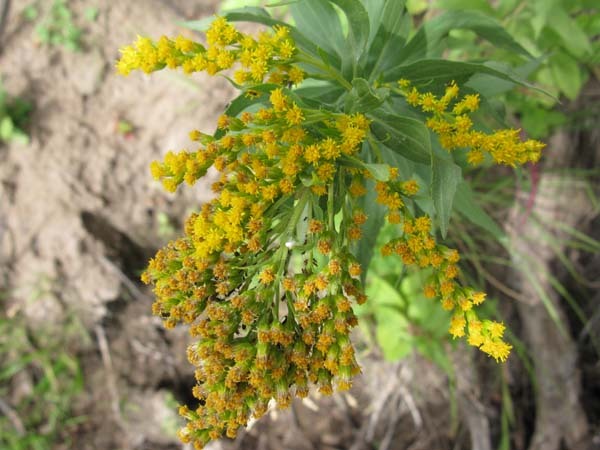 A native to North America, this is one of 75-100 species in the genus Solidago (Goldenrod). There are 6 varieties of the perennial herbs: candensis, gilvocanescens, hargeri, lepida, salebrosa, and scabra. This species doesn't do well in shade. 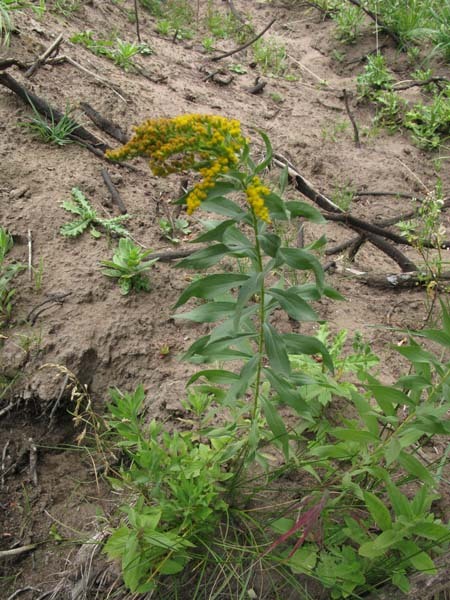 Per WIKIPEDIA, it typically is one of the first plants to colonize an area after disturbance (such as fire) and rarely persists once shrubs and trees become established. 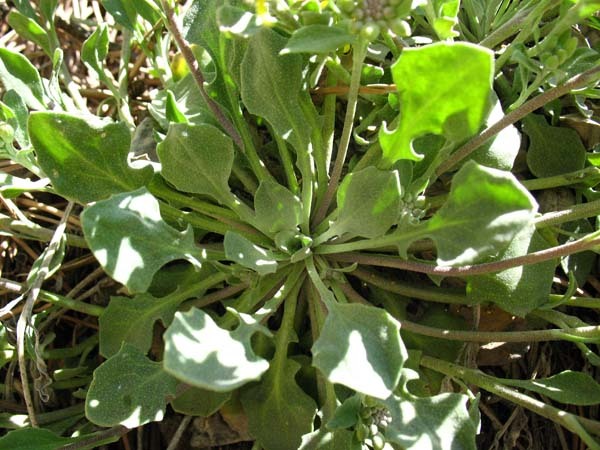 USES:Per the website Plants For a Future: Young leaves and flowering stems - cooked. Seed, used as a thickenerp in soups. The seed is very small and is only used as a survival food when all else fails. A tea can be made from the flowers and/or the leaves. 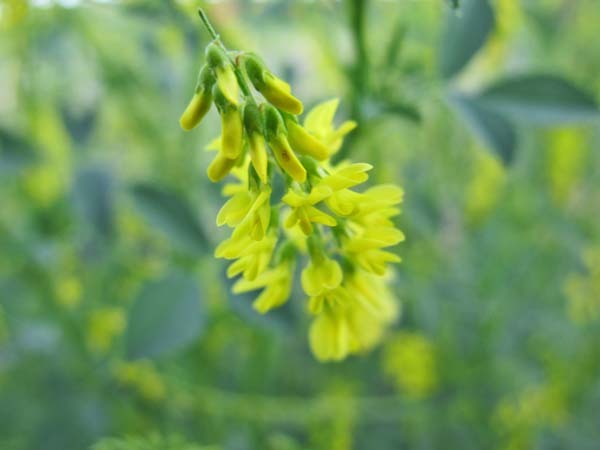 Mustard, orange and brown dyes can be obtained from the whole plant. A rather greedy plant, it is apt to impoverish the soil. The flowers attract butterflies and moths. The plant also attracts various beneficial insects such as ladybirds, lacewings and hoverflies to the garden, these insects will help to control insect pests in the garden.